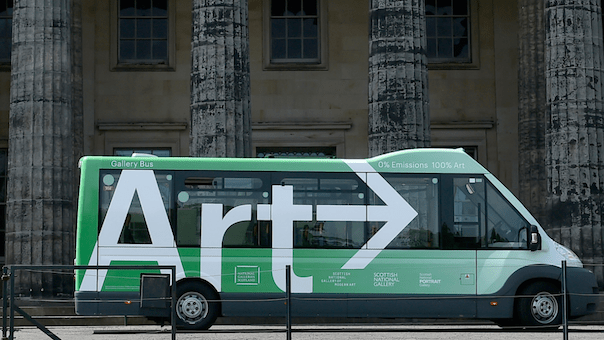 The National Galleries of Scotland (NGS) is to launch a new, fully accessible electric bus – the first of its kind in public service in Scotland – on its much-loved shuttle service between its three main Edinburgh sites. The zero-emissions Orion E bus, is the Scotland’s first fully electric, fully low floor bus, and has been designed for maximum accessibility. The NGS comprises the Scottish National Gallery, in the heart of Edinburgh’s world heritage site, the nearby Scottish National Portrait Gallery, and the Scottish National Gallery of Modern Art, which is located in Edinburgh’s leafy west-end. The popular daily shuttle service for gallery goers links the three sites, operating on a circular route throughout the day, seven days a week. The NGS Orion E, in its eye-catching new livery, will be officially commissioned on Monday 28 May. The Orion E is built by Mellor, a leading manufacturer of small buses and specialist passenger-carrying vehicles. It combines an environmentally friendly all-electric drive system with class-leading step entry and flat floor throughout, making it both accessible and versatile. With a range of 100 miles on the super-efficient LiFe PO4 batteries, the Orion E is also incredibly economical to run – it’s estimated that it will cost only £500 in electricity per year with a saving of around £1,420 in fuel and tax each year. The introduction of the bus will result in an annual saving of 3.0 t CO2 carbon emissions. A timetable for the gallery shuttle service is available on the NGS website.